One of the greatest ways to spend quality time with your dog is to go on a long, off-leash hike. Fresh air, exercise, views, lots of great smells for your pooch to investigate—and a tired pup at the end of the day. I’m particularly fond of the State Arboretum of Virginia, which is in Boyce, Va., about an hour and a half drive from D.C. There are 172 acres of wooded trails, open fields and picnic areas. Best of all, dogs under voice command are allowed off leash everywhere except within 200 feet of the buildings. Here are a few tricks to make your off-leash hiking experience safer for all. Use a key ring to attach a bell to your dog’s collar. The purpose is twofold. If you lose sight of your dog, you will still be able to hear him, at least until he’s really far away. The bell also serves to announce your dog’s approach to wildlife, hikers and horses. Wildlife will run in the other direction, and hikers and horses won’t be startled by your dog bursting around a trail corner. The last thing you want to be is apologizing to a horseback rider who’s been thrown by their spooked horse. 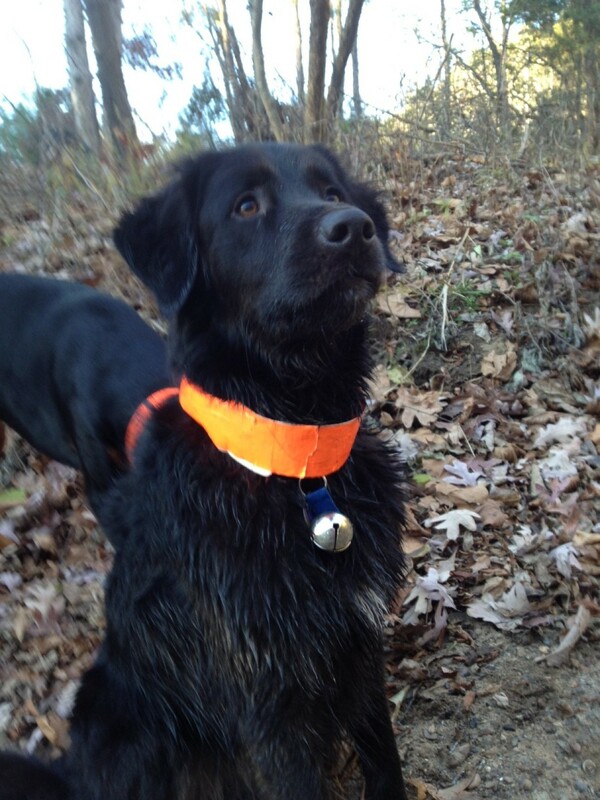 Use bright orange duct tape to make a collar. While you never want to hike where hunting is in season and legal, it’s still best to make sure no one will mistake your beloved pooch for a deer or other wild creature. Craft stores and even Target sell brightly-colored duct tape for craft projects, including the universally-recognized “flame orange” color donned by hunters. Fold a length of the tape over onto itself so the tape doesn’t stick to your dog’s fur, leaving about ½ inch sticky section to close the loop. When I go hiking with the girls, I periodically call them back to me for no reason except to reward them with a treat such as cut-up hot dogs, or something with a strong smell that they don’t get every day at home. That way, even if they are distracted by a smell on the trail, they are more inclined to respond to my call quickly knowing I’m harboring exceptionally yummy rewards. It may be inconvenient, but if you or your dog get hurt or in a situation where you need to summon help, you will be glad you did. I’m sure there are many more tips for safe hiking, but the best thing you can do is just use common sense and plan for whatever could happen, even while hoping it doesn’t. With off-leash hiking, the rewards far outweigh the risks, so go out and enjoy the great outdoors with your canine pal!